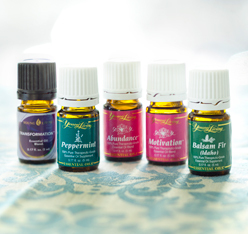 During January, place an order of 239 PV and receive a free Transformation kit with 5-ml Idaho balsam fir, Motivation™, Transformation™, Abundance™, and peppermint essential oils in a beautiful organza bag-that is a retail value of $153.94! Offer is valid from 12 midnight, MT, January 1, 2013, to 11:59 p.m., MT, January 31, 2013. Limit of one free Transformation kit per order. PV minimum must be reached in a single order. Partial orders placed throughout the qualifying month cannot be combined in order to receive the promotional product(s). Offer is available to Young Living Independent Distributors and retail customers. Offer is valid on phone, Essential Rewards, and web orders only. Member is responsible for shipping costs associated with free product. Offer is valid in the U.S. and all NFR markets, except where restrictions prevent promotional product(s) from entering your country. * Statements made on this site have not been evaluated by the Food and Drug Administration and are not intended to diagnose, treat, cure, or prevent any disease.